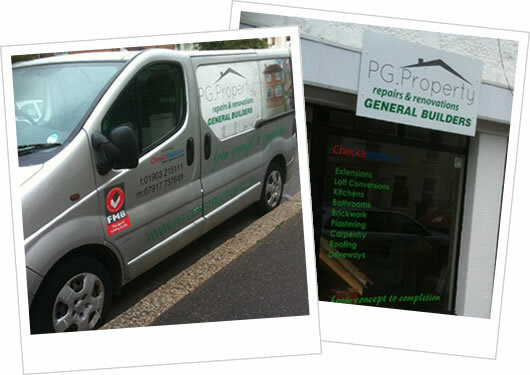 Based in Worthing, West Sussex, PG Property Repairs & Renovations have been established in the area for 15 years. With an excellent reputation for all building works, offering a professional and reliable service to both small and large builds. PG Property Repairs & Renovations are members of the Federation of Master Builders. We strive to provide fantastic customer service and build quality, keeping within timescales and financial targets. If you've got any questions please call on 01903 215111, fill out our enquiry form, or visit our office at 103a Newland Road, Worthing, West Sussex. Having dealt with contractors over many years as a Chartered Surveyor, I have no hesitation in providing a reference for Patrick Gillespie. PG Property Maintenance & Repairs have undertaken small and large repair works in addition to difficult conversions and new builds. His work quality and attention to detail is good with budgets adhered to, save for extras which have been explained and advised of before being undertaken. An unusually well rounded and talented builder and a pleasure to work with. Working with PG Property and Repairs will be hassle free with satisfaction guaranteed. Please get in touch to arrange a free no obligation estimate to discuss your building requirements.